I've been visiting the antique fair at Ardingly on and off for years. It is most enjoyable to wander around looking at the interesting bits on sale, and sometimes I pick up a few textile or paper items to use in my work. Last week, on a sunny but very muddy day, I wrapped up warm and went for a browse, taking my mum and the dog along for company. I was particularly after some old papers such as Victorian invoices. There is usually a stall selling papers and old postage stamps but unfortunately, it wasn't there. However, one of the things that make a visit really interesting is that you never know what you will find. So my first purchase was some papers including these old rail tickets. My favourite is the one in the top left-hand corner - the ticket for one dog. My big find was two cushion sized panels of corded quilting. I wasn't sure how old they are, but the feel of the burnt-orange crepe suggested they were not modern. They are identical, although one has a slight mark on it, but that is barely noticeable. Never made up into a finished item, they must have lived at the bottom of someone's sewing cupboard for years before ending up with a dealer. As soon as I picked them up I knew I had to have them, although the £2 price tag helped me make a swift decision. 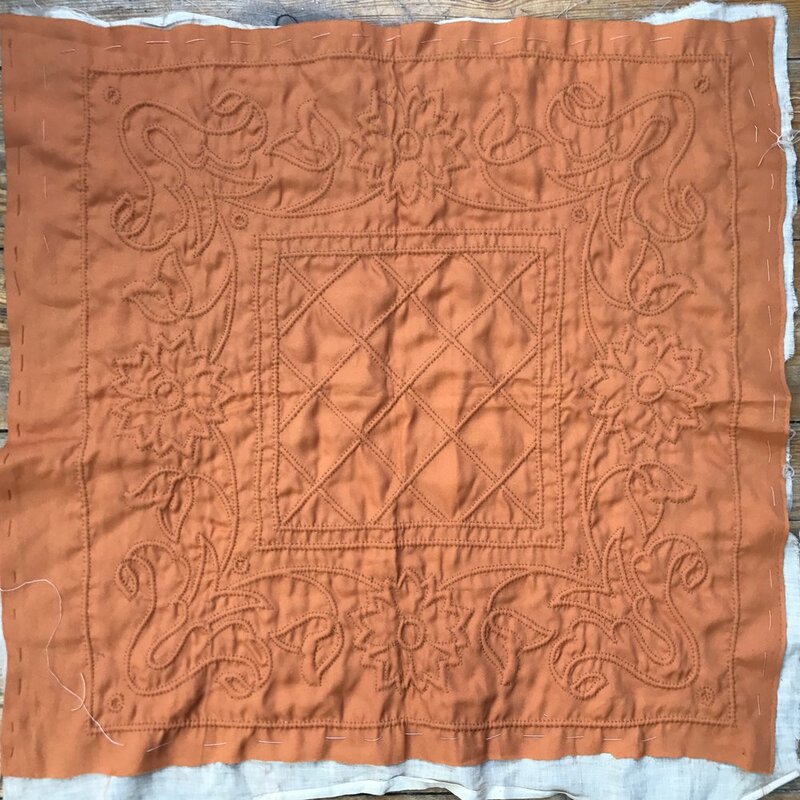 The outlines have been handstitched (exquisite tiny stitches) in a dark coral thread. 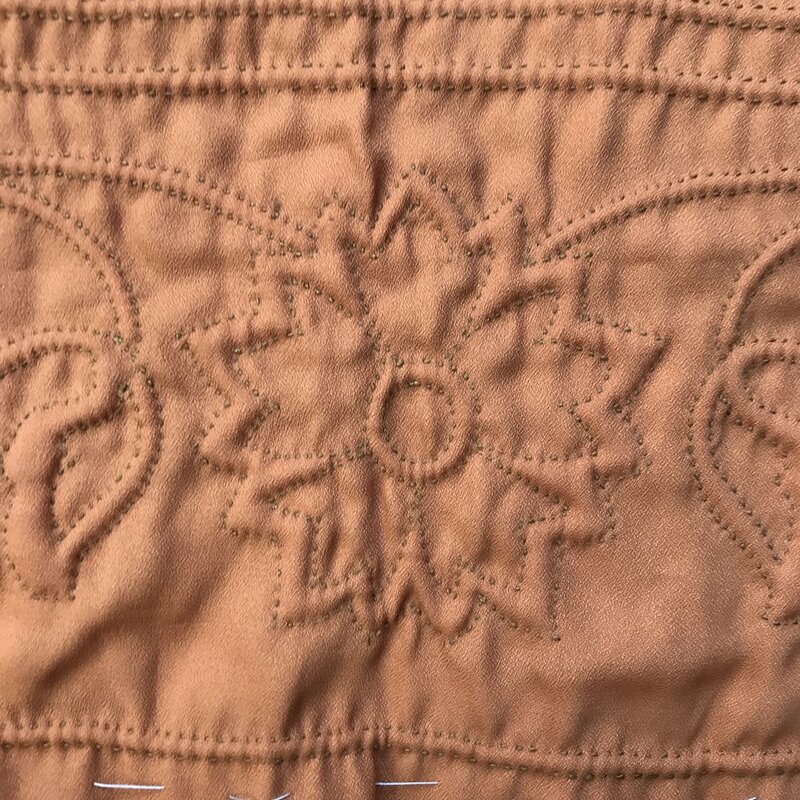 I cannot see any markings to suggest how the design was transferred, however, both panels are identical and symmetrical so knew they would definitely have been marked. The backs are just as beautiful, and it is interesting to see how the wool has been pulled in and out of the channels. I have tried corded quilting and the extra loops always cause a bit of a 'am I doing it right' anxiety. Interestingly, they are both finished. Often when I find pieces like this they are incomplete, but these are ready to be made up into an item. The designs reminded me of some I saw in a 1930s embroidery transfer catalogue which was produced by Liberty. So, I did an internet search and was delighted to find the exact design here, and that was produced by Briggs and Co. It has the catchy design number of 51159/C. Briggs & Co were the first company to produce transfers, and the company was bought out by Coats in the 1930s. They were involved with the Needlewoman shop on Regent Street which I always see listed in the suppliers list in old books and would love to have visited. I cannot find an age for the booklet, but it the design is similar to the ones I have seen in Barbara Chainey's post here that she dates to the 1940s. So, can I assume it was made 70 years ago, or did someone get the transfer and sew it at a later date? Who knows, but add a tantalising detail to my bargain buy. I am not sure if I will do anything with them, or keep them as they are to take along to workshops. The stall also had old cotton sheets at excellent prices so I bought one of those. Although it has a few age marks it is huge, and once cut up I can select the bits I want. 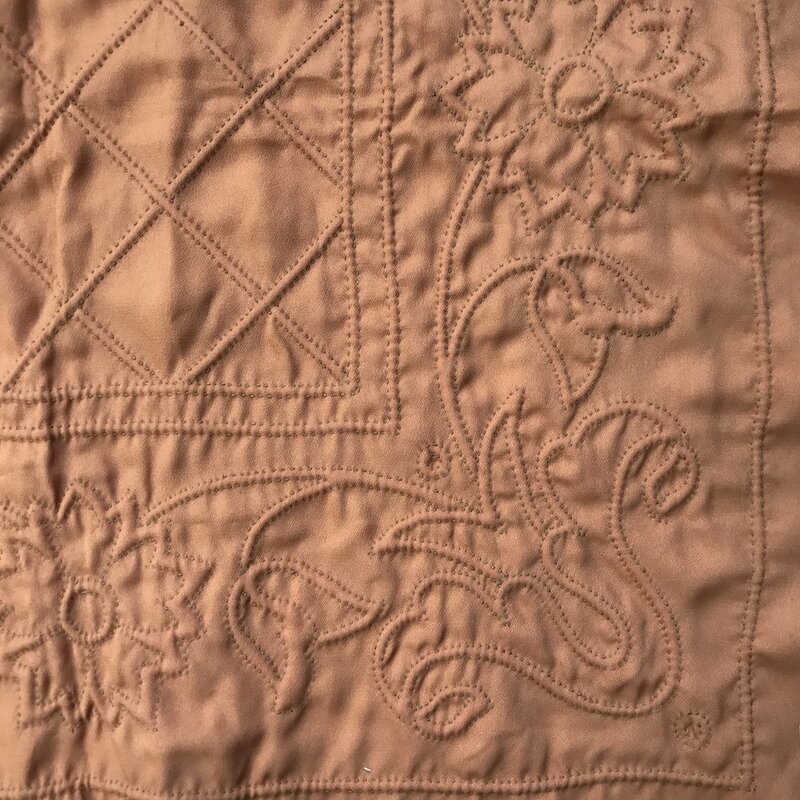 They don't make cotton the same weight as they used to, and it holds hand embroidery beautifully. No photo though, an old white sheet is nowhere near as attractive as these panels.